GCC 1.27 was released in 1988 and is the first version of GCC supporting the x86 CPU. I thought it would be fun to make it work on my desktop computer. Mikhail Maltsev wrote a great blog post about this a while back “Building and using a 29-year-old compiler on a modern system”. I used Mikhail’s work as a starting point, but I built on a 64-bit Ubuntu system so I needed to update paths and as/ld options for running on a 64-bit OS, and I had much bigger problems with the ancient GCC not understanding the system headers. I also enabled the DBX debug format instead of the UNIX/32V SDB format that GDB does not understand. But I did not need to make that big changes to Mikhail’s patch. I have built the compiler on 64-bit Ubuntu Desktop 16.04 as described below. make CC=stage1/gcc CFLAGS="-O -Bstage1/ -Iinclude"
As a third, optional, step, we build it again using the second compiler and checks that the resulting binaries are identical with the second compiler (if not, then the compiler has miscompiled itself). make CC=stage2/gcc CFLAGS="-O -Bstage2/ -Iinclude"
There are lots of information about C64 available on the net, but I have not found any convenient place that collects the relevant information... But everything I needed (including examples/tutorials) was available at C64 Wiki and Codebase 64. The details of the Video Interface Chip is documented in “The MOS 6567/6569 video controller (VIC-II) and its application in the Commodore 64”, and Andre Weissflog’s chip emulators contains very readable code if you want clarifications on what the various hardware registers do. My first test was to implement two raster bars and some sprites moving around, just to verify that I understood the basics. Much of C64 programming centers around getting around hardware limitations by timing the code carefully. For example, the raster bars are drawn in the border of the screen, but the border can only have one color. 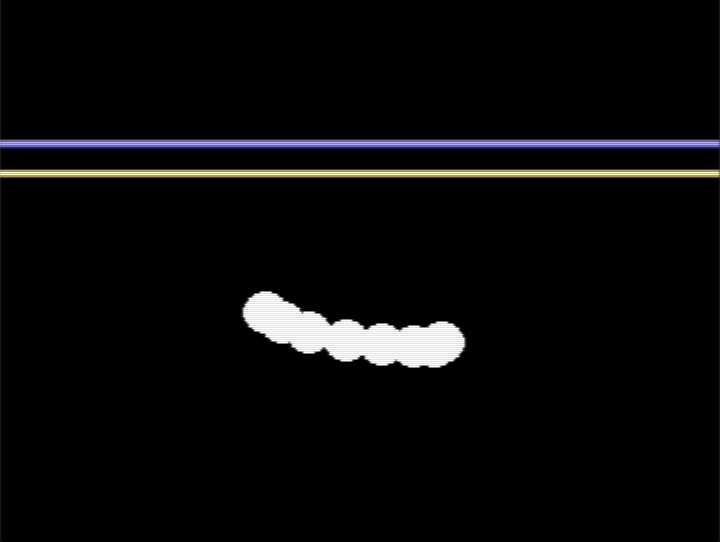 It is, however, possible to modify the border color while the hardware is drawing the screen (the C64 hardware is designed for old CRT monitors that draw the picture one line at a time using an electron beam), so we can draw the raster bars by changing the border color exactly when a new line starts! I had thought the raster bars should be trivial (just enable an interrupt on a line, and change the colors) but the C64 is not fast enough for this – it takes 9-16 cycles to enter the IRQ, so we are already a bit into the screen when we can change the color. And there are only 63 CPU cycles for each line, so we don’t have the time to set up a new interrupt for the next line anyway. We, therefore, need to first synchronize our code with the start of a line, and then write the code (using NOPs etc. to pad it out) so that we change the colors exactly every 63 cycles. The first raster line of each text line must fetch the characters, which steals one cycle per character. These lines are usually called “bad lines”. Each sprite that is enabled on the raster line steals 2 cycles. There is, in addition, an overhead to this cycle stealing mechanism that may waste up to 3 cycles per raster line (depending on what the CPU is doing when the cycle stealing starts). I was lazy and ensured that my raster bars were not on a bad line and that there were no sprites on the same raster line, but careful programming can handle this kind of things too. The talk “Behind the scenes of a C64 demo” mentions some insane techniques, such as treating the cycle counter as an address and jump to it (this jumps to different addresses depending on how many cycles have executed, and careful layout of the code can make this compensate for differences in execution time). The resulting program test.prg can be run in the VICE emulator by loading it using the “Smart attach Disk/Tape” option. The performance of programs depend surprisingly much on things that “should not” matter (such as the order files are passed to the linker), and modifying one part of the program may change the performance of other parts. takes 11.0 seconds1 on my PC (Ubuntu 16.04, Intel Broadwell CPU). at the top of measure.c makes the program need 11.8 seconds to run – it has become 7% slower by just adding an unused function! The only effect of adding the unused function is that some other functions are moved to different addresses2, so it is natural to attribute the performance difference to “cache effects“. But there are several other hardware bottlenecks that can cause this kind of performance variability – this particular case is due to branch prediction. Branch predictors keep track of the histories of branches by building various tables in hardware (see Dan Luu’s great blog post). But the branch prediction hardware looks only at a few bits of the addresses, so several branches may map to the same slot, with the result that the branch predictor cannot differentiate between them. Changing the size of one code segment makes other parts of the program move to different addresses, and some branches may be unlucky in that they now alias with branches behaving in a different way, which cause the performance to regress due to the excessive misprediction. All books and conference talks about optimization tell you to always measure your change to verify that it actually improves the performance before committing. This is a good advice, but just measuring the running time is not enough! For example, if our change to libquantum was a real improvement that made the code 5% faster, then we would still have seen a 2% regression due to the (unrelated) branch prediction issues. But this regression is just us being unlucky with code placement, and further changes may make us lucky again, so it would probably have been better long-term to do the change. Similarly, I have seen too many bad changes done because “we measured it, and this made the program faster (but we do not understand why...)“. So it is often useful to dig deeper and understand why we get the performance result so that we can attack the root cause and not rely on being lucky – for the libquantum example we could ensure the branches in the sensitive part of the code are located near each other in memory (for example, by forcing the code to be inlined) or try to eliminate some branches by algorithmic changes. “Producing Wrong Data Without Doing Anything Obviously Wrong!” has a more detailed discussion about these issues. “Intel 64 and IA-32 Architectures Optimization Reference Manual” describes many of the hardware bottlenecks for Intel CPUs. The principles are (mostly) the same for other CPUs, altoght the details are different. The running time of this is stable (11.0 seconds with a standard deviation of 0.014). 2. It could also have made the compiler make different inlining decisions etc., but I have verified that the only difference for this program is that some code is placed on different addresses compared to the original version. Inlining is important for C++ performance, but the compiler must be careful not to increase the code size too much. GCC’s inlining process is basically inlining functions sorted by priority until a growth percentage limit is hit (or until all relevant functions have been inlined), which works fine for large translation units where the parts of the code not helped by inlining can compensate for the code increase in the parts where inlining helps. But it works less well for small translating units that need much inlining, which is common when doing microbenchmarks. Take for example this quick-bench benchmark from Bartlomiej Filipek’s blog post “Speeding Up string_view String Split Implementation” that measures the performance for different ways of splitting a string. 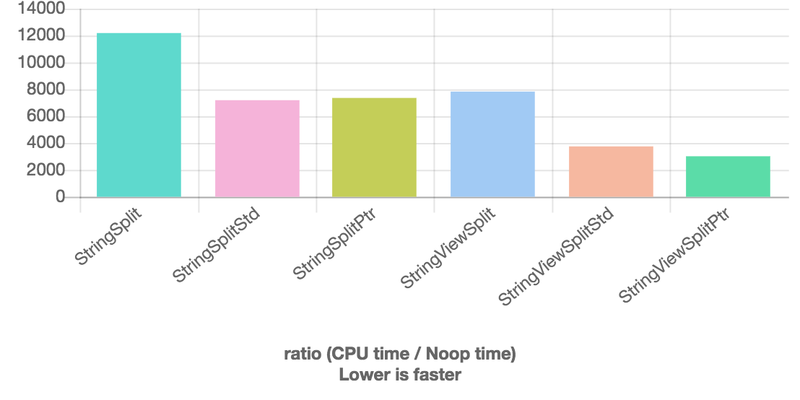 We can see that StringSplitStd is about 9% faster than StringViewSplit (they have the score 7829 and 7189), but the reason for this difference is that GCC has inlined everything for StringSplitStd, but not for StringViewSplit. We get a different result if we run the benchmark with a different set of functions. 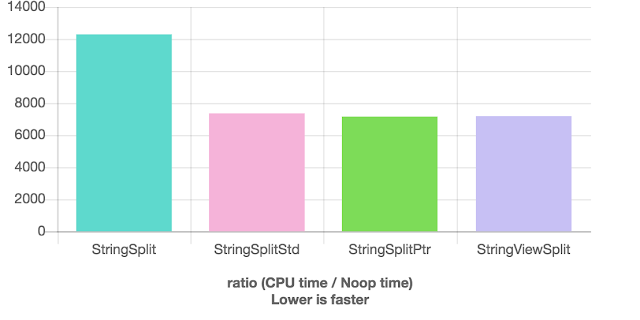 For example, removing StringViewSplitStd and StringViewSplitPtr from the benchmark makes the compiler make different inlining decisions, and we get the same performance for both StringSplitStd and StringViewSplit (quick-bench). It is a good idea when doing microbenchmarking to check that the compiler makes the same inlining decisions as when the code is used in a real use case (in a realistically sized translation unit). We are going to look at how compilers may optimize it in ways that were probably not intended. Note that the call to __ctype_tolower_loc is now outside of the code segment being measured! That is, the compiler has used its knowledge of the input to basically hard code the result (this may be OK, depending on what the benchmark is trying to measure). And it has moved some code out of the code segment being measured (which is probably not OK for the benchmark). I usually prefer keeping the benchmarked function in a separate translation unit in order to guarantee that the compiler cannot take advantage of the code setting up the benchmark, but that does not work in quick-bench. One way to get a similar effect is to mark the function as noinline, but that only solves part of the problem – compilers do various interprocedural optimizations, and for GCC you should specify at least noclone too. Other compilers may need to be restricted in different ways. It may also be possible to hide information from the compiler by using volatile or functionality from the benchmarking framework (such as benchmark::DoNotOptimize and benchmark::ClobberMemory), but this may also introduce unintended behavior. For example, these workarounds make the code look “unusual” to the compiler, which may make various heuristics make different optimization decisions compare to normal usage. With microbenchmarks, like a trial lawyer during cross-examination, you should never ask a question you don’t know the answer to (or at least have a pretty good idea of what it is). Real-world systems are generally too complex and intertwined to understand from surface measurements alone. If you have no idea how a system works at all, you don’t know what the right questions are, nor how to ask them, and any answers you get will be opaque at best, if not outright garbage. Microbenchmarks are a useful tool to confirm that an existing model is a good approximation to reality, but not very helpful in building these models to begin with. 1. The libstdc++ headers use a normal function call for tolower instead of using the inlined version from ctype.h. You can see the optimization from this blog post using libstdc++ too by including ctype.h before any C++ header (but this is not possible in quick-bench, as it adds its own headers before the user code). Some useful address sanitizer checks are disabled by default because they are relatively expensive (or, as for the std::vector checking, need to be enabled for all translation units). The address sanitizer warns when a variable is used after it has gone out of scope in a function, but it does not warn when the variable is used after the function return. That can, however, be enabled by adding detect_stack_use_after_return=1 to the ASAN_OPTIONS environment variable. It is not valid to compare two pointers from different objects using the relational operators <, <=, >, and >=. This can be detected by compiling with -fsanitize=address,pointer-compare and adding detect_invalid_pointer_pairs=1 to the ASAN_OPTIONS environment variable. Note: -fsanitize=pointer-compare was added in GCC 8. It is not valid to subtract pointers that point into different objects. This can be detected by compiling with -fsanitize=address,pointer-subtract and adding detect_invalid_pointer_pairs=1 to the ASAN_OPTIONS environment variable. Note: -fsanitize=pointer-subtract was added in GCC 8.
because the memory is valid, even though it is an error to use it. It is possible to make the address sanitizer warn for this by compiling with -D_GLIBCXX_SANITIZE_VECTOR which makes libstdc++ annotate the memory so that the validity can be tracked. The annotations must be present on all vector operations or none, so this macro must be defined to the same value for all translation units that create, destroy or modify vectors. Note: _GLIBCXX_SANITIZE_VECTOR was added in the GCC 8 libstdc++. that is passing a constant array to maxArray. It is valid to cast away const as long as the object is not written to through the pointer, so this program is correct – y[i] is never bigger than x[i] for any i, so maxArray will never write to x (the mask in the vectorized code is never set, so the vmaskmovpd instruction is essentially a nop). The code from maxArray2 does, however, always write to x so it would crash on this input as the compiler places a1 in read-only memory.